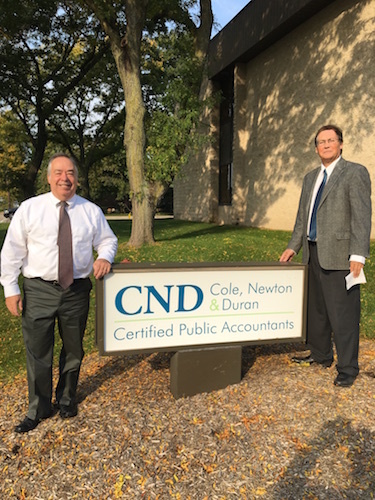 Cole, Newton, and Duran CPAs, a Livonia-based accounting firm, has acquired accounting and business consulting firms Bartos, Hoffer, Lustig, and Tomes PC, also located in Livonia, and Michael G. Thomas CPA in Novi. Terms of the deal were not disclosed. As part of the acquisition, 15 new team members will join Cole, Newton, and Duran CPAs for a total of 40 employees, and the firm, which has offices in Livonia and Plymouth, will obtain Michael G. Thomas CPA’s Novi location. Mike Tomes of Bartos, Hoffer, Lustig, and Tomes PC, and Mike Thomas of Michael G. Thomas CPA, will also join Cole, Newton, and Duran CPAs as partners. Bartos, Hoffer, Lustig, and Tomes PC employs five professionals who focus on providing tax preparation, planning, bookkeeping, and accounting services. The firm works with auto related businesses, repair facilities, racing tracks, collision shops, gas stations, tire stores, and luxury suite leasing companies. Michael G. Thomas CPA employs 10 professionals who focus on providing accounting and tax services to business owners, nonprofits, executives, and independent professionals. Along with the two acquisitions, in the last five months, Cole, Newton, and Duran CPAs has also hired a chief marketing officer and a chief legal officer in an effort to support its growth strategy. Cole, Newton, and Duran CPAs, which offers accounting, auditing, taxation, investing, personal financial planning, and consulting services, will mark its 50th anniversary next July. Cole says the firm is open to future acquisitions along with opening a Detroit office.